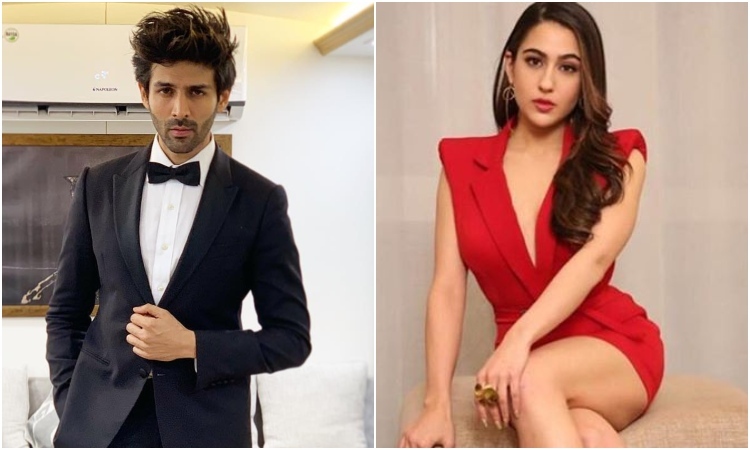 Since Sara Ali Khan revealed Kartik Aaryan was her crush, the fans have been going gaga to see them collaborate for a film. Recently, the duo is often seen enjoying each others company. The two are extensively shooting for their first film together, which is an Imtiaz Ali directorial tentatively titled as Love Aaj Kal 2. The two are finally getting along and we are already in love with this Jodi. A new video of the two has surfaced the internet, as they are currently shooting their first film together, shows their chemistry. The video was shared on fan pages online and shows Sara embarrassing Kartik by screaming out his name and laughing hysterically at his reaction. Egged on, Sara yells out Kartik's name in public, only to have the Luka Chuppi actor laugh nervously and try to cover her mouth. Their fans almost willed the two together, after Sara admitted to having a crush on Kartik on an episode of Koffee with Karan. The Sonu Ke Titu Ki Sweety actor told the media a few days later that he's open to going on a date with Sara. A first look image from the film, which shows Sara resting her head on Kartik's shoulders was also shared by the actors on social media. Kartik also left a comment on Sara's recent Instagram post, which showed her posing with her first Filmfare award. The actor has also had to field questions about a rumoured kiss video that had gone viral. "Was that really Sara and me?" Kartik said when asked about the video. Sara made her film debut with Kedarnath and followed it up with the blockbuster Simmba. Kartik burst onto the scene with a star-making turn in Sonu Ki Titu Ki Sweety. He will also star in the remake of Pati Patni Aur Woh. Deepika Padukone expresses her proudness for hubby Ranveer with a KISS WHAT HAPPENED when Katrina Kaif, Alia Bhatt and Ranbir Kapoor met?